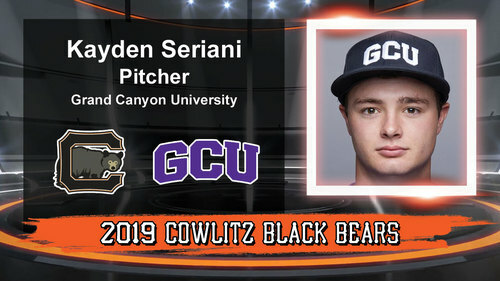 The Cowlitz Black Bears are happy to announce the signing of the Grand Canyon University freshman Kayden Seriani. Seriani is a talented right-handed pitcher for the Antelopes. He commands an upper 80’s to low 90’s heavy fastball with very good secondary pitches. The highly recruited Colorado native was 19-1 with a 0.74 in his three years pitching for Paonia High School. A strong and athletic player who attacks the strike zone, he struck out 310 and issued only 28 walks. Please join us in welcoming Kayden Seriani to the 2019 Cowlitz Black Bears!